Just 300 examples of the Mercedes-Maybach S650 Cabriolet will be built. 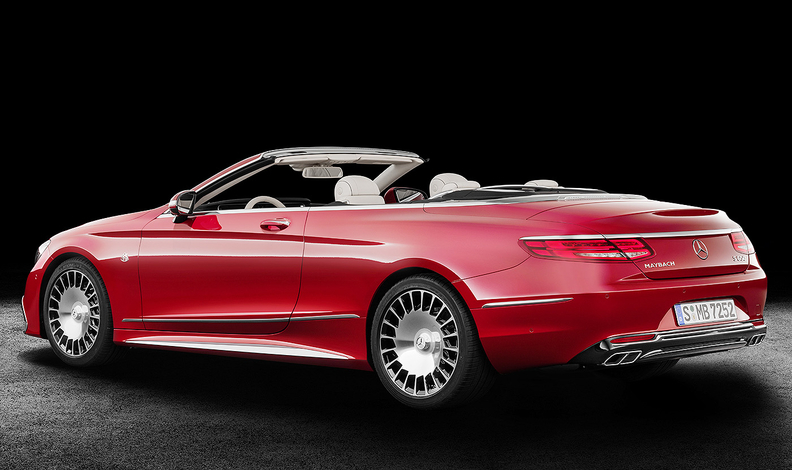 LOS ANGELES -- Mercedes is expanding its Maybach line with a new limited-edition S-class convertible. Mercedes unveiled the Mercedes-Maybach S650 Cabriolet Tuesday at an event on the eve of the Los Angeles auto show. The company will produce just 300 units of the vehicle. It's the third entry in the company's Mercedes-Maybach subbrand and will begin sales next year. The Maybach convertible is powered by a 6.0-liter V-12 twin-turbo engine that produces 621 hp. The Maybach convertible will have a net price of 300,000 euros in Germany, Mercedes said in a statement. The Mercedes-Maybach S650 is based on the new S-class convertible, which went on sale earlier this year. Exclusive Mercedes-Maybach features include a new front bumper design and numerous chrome highlights. The Maybach emblem is featured on the vehicle's fender. The interior includes a number of high-end appointments exclusive to Maybach, including special chrome-plated numbering indicating the vehicle's production order among the 300 that are planned. The Maybach convertible joins the Mercedes-Maybach S600, which launched in the summer of 2015, and the Mercedes-Maybach S5504MATIC, which was introduced in the summer of 2016.